Take extra care washing your salad greens and lettuce. Lots of rain this past week, splashing mud onto the greens. It started on Tuesday, and kept going much of the time through Saturday…inches of rain. Because we subsoil (deep till) our beds and don’t drive on the beds (we straddle them), our clay soil drains quite well. We don’t have water pooling in the fields, and the crops are growing at a pace I have never seen before. 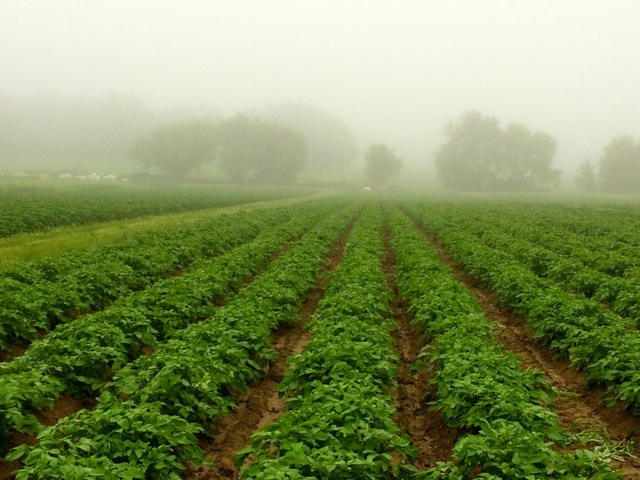 Morning mist rises from our wet potato fields. Within a week, we won’t be able to see the soil between these potato plants; the potato vines will have completely filled in the spaces between the rows. Last Monday we had our annual organic inspection; it lasted most of the day. We keep thorough records of our inputs, yields, varieties, and practices to ensure that our crops are grown according to organic standards. Certification takes place upon review of the inspector’s report by MOSA (Midwest Organic Services Association). The inspector seemed quite pleased by our records and practices, so we do not anticipate any problem in continuing with our organic status. 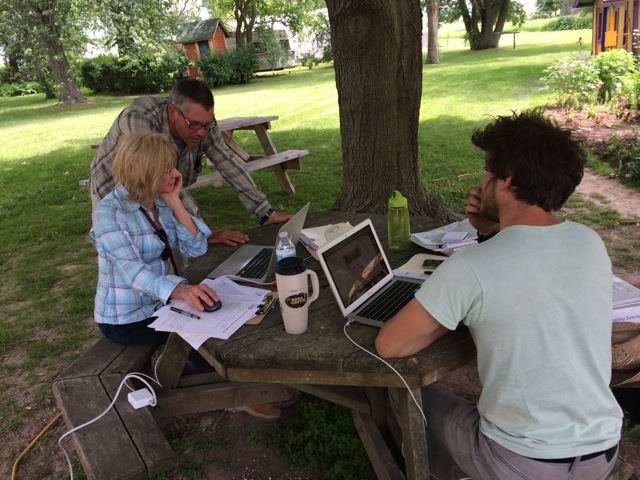 (from left) Growing Manager Chris Voss, Organic Crop Inspector Mary Wilson, and Fertility Manager Andrew Stewart review 2013 Angelic Organics organic growing records and 2014 projections. Of course, the work didn’t stop with the organic inspection. We packed, harvested, hand weeded, hoed, trellised, bunched, bagged, washed and delivered vegetables, repaired trucks, patched wooden bins and cribs, fixed pallet jacks, mowed cover crops and driveways, mechanically cultivated weeds, hilled potatoes, seeded fall crops in the greenhouse, tended the farmstead flower gardens, trimmed weeds, repaired a cooling system, resumed construction on our milkhouse …oh, yeah… and organized the laundry room. This was a typical week’s work. The Crops and What about the Weeds? We can see the changes in the crops daily, as the potatoes, cucumbers, melons, and squash sprawl incessantly and the corn bursts skyward. Weeds also grow fast when it rains, but so far, our relentless standards for weed control are triumphing. How do we outwit the weeds? Hand pulling; hand hoeing; stale seedbedding; hilling, power-wiggle-hoeing (our farm staff coined this term); three-row, two-row and one-row mechanical cultivating; tine weeding. (I would happily elaborate on these methods, but space and time are limited.) Our goal is to not let weeds go to seed, so they won’t contribute to the weed population in the following year. We strive to eradicate the weeds before we can even see them. 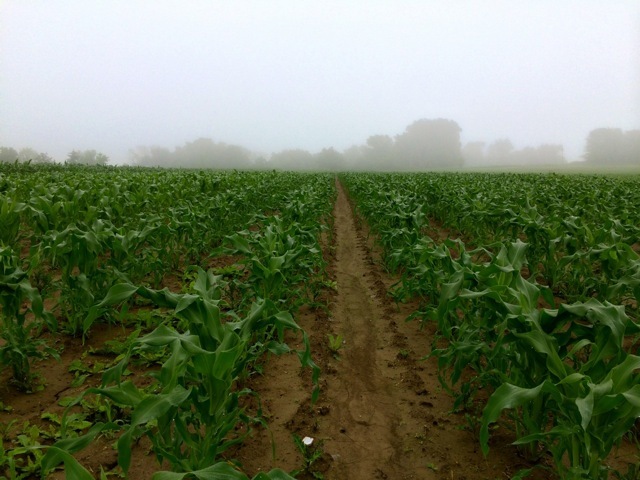 Some growers are so daunted by weeds that they decide to co-exist with them. At Angelic Organics, we aren’t that hospitable to the weeds. Sweet Corn. The few weeds you see in this photo will probably be gone by the time you are reading this newsletter. We celebrated the June 21 birthdays of Angelic Organics employees Jeff Robare, Margaret Nelson, and 5 cats. 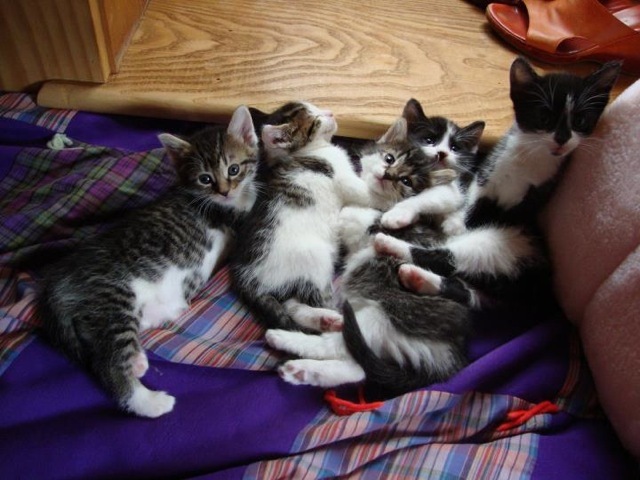 Three years ago, on the afternoon of the Summer Solstice, our iconic cat SpennyTheWenny crawled up on Haidy’s lap and gave birth to 5 wondrous kittens. Peanut Squeanut Pants and Whiskey the Baby Doughnut still live with Haidy and me, along with their Uncle Darleney the Doughnut Elder (we thought he was a girl at first) and the occasional guest George Porridge Storage. Gatita lives across the road with Primo and family. $500.00 per seat. A once in a lifetime experience to sit at a table with Farmer John. Only eight seats available (and includes a ride to and from Chicago with cocktail reception, if needed). Upon learning about the ticket fee for this table, my sister said to Haidy, “WHAT? I would pay 50 cents to sit next to John. I’d pay $500 to sit next to you, Haidy. This is a confusing bidding war. Angelic Organics Learning Center is an exciting and engaging place to learn about food, farming, and caring for the earth. Sign up for a hands-on farm workshop now at http://www.learngrowconnect.org/events .